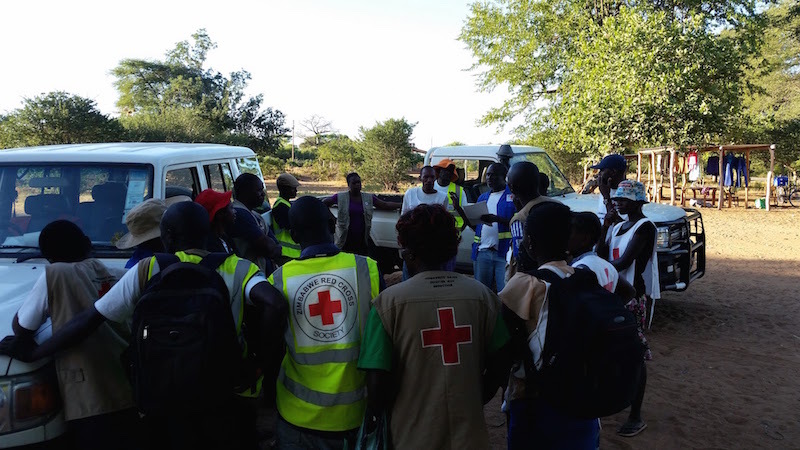 I recently spent a week in Binga District, with the Zimbabwe Red Cross Society, training their local volunteers to map Red Cross interventions in their communities, using OpenMapKit. 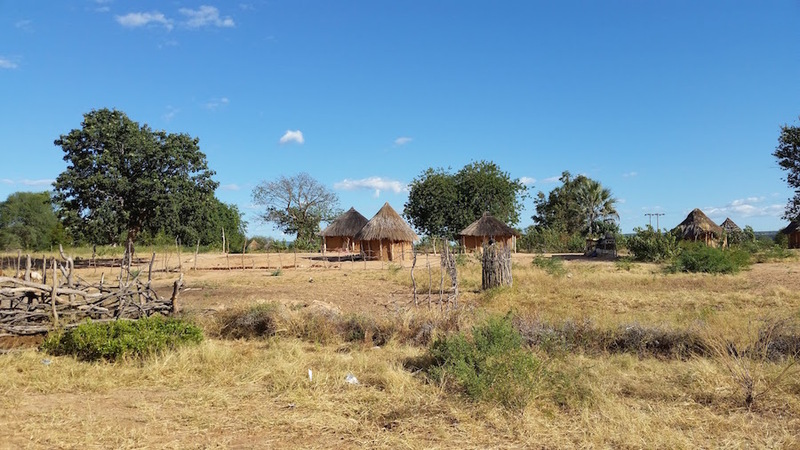 The drought in southern Africa has heavily impacted the rural communities of Zimbabwe, where most of the communities rely on subsistence farming in their daily lives. Typically, men will work the farms during the day, while women will search for water. From the bridges over the dry river beds, you can see community members digging holes into the ground to attempt to reach the water table. 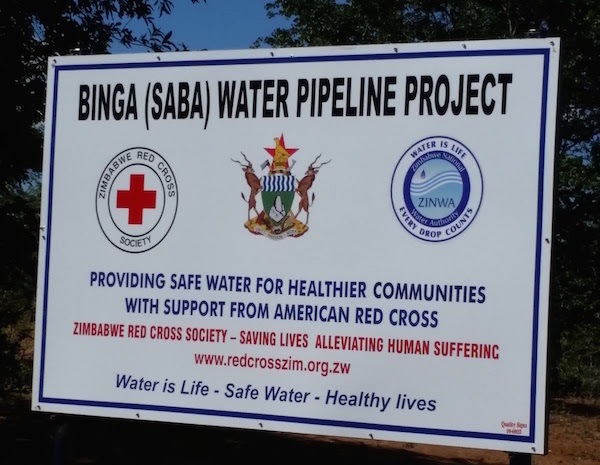 In 2014, the American Red Cross partnered with the Zimbabwe Red Cross society to extend a water pipeline in the Saba Ward of Binga District. This pipeline added an additional 15 km to an existing pipeline which stretches from Lake Kariba into Saba Ward. 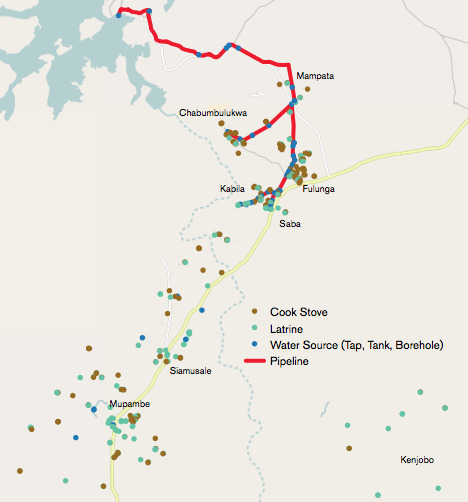 Schools, clinics, and communities now have access to this pipeline, and therefore access to drinkable water. Women in these communities no longer need to spend their day searching for water in a dry river bed, with no guarantee of success. Sign highlighting the partners who implemented the pipeline project. CC-BY American Red Cross. In addition to the pipeline access, the Building Resilient African Communities (BRACES) project has produced a number of other interventions in Saba Ward, as well as 3 other wards in Binga District. These interventions include water storage tanks, water taps, latrines, and cookstoves. 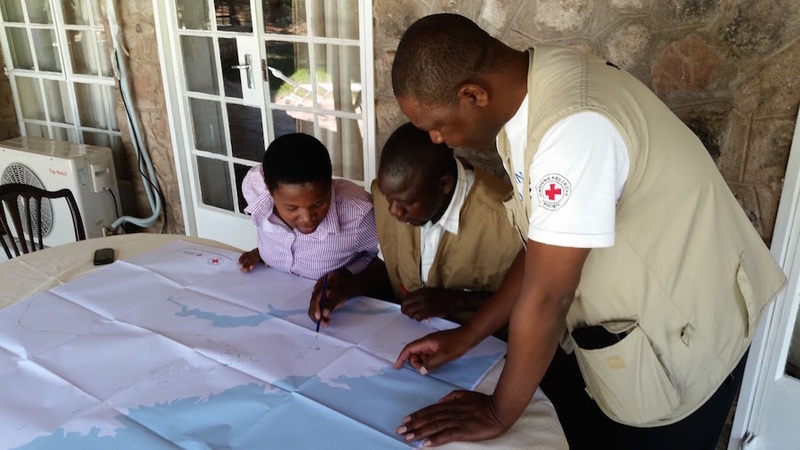 Prior to my trip to Binga, I worked with the Zimbabwe Red Cross Society to identify the features in the region that they wanted to map. Binga is about a three-and-a-half-hour drive from Victoria Falls. Binga District itself, is located in northwestern Zimbabwe sharing a border with Zambia, separated by Lake Kariba, the world’s largest man-made lake by volume. 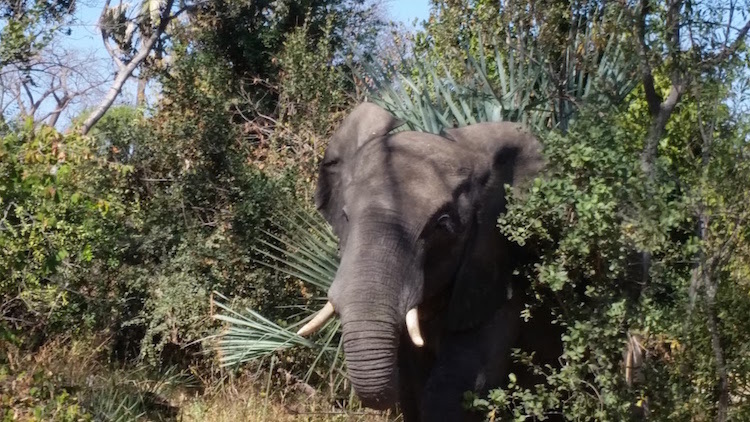 The first part of the drive heads east alongside the Hwange National Park. The rest of the drive takes you north into Binga District, with endless skies and beautiful savanna grasslands. A Tonga homestead in the savanna. CC-BY American Red Cross. Prior to the start of the workshop, I joined representatives from the ZimCross Harare Office as well as the the provincial representative in meeting with the Binga District administrator. She graciously met with us on Monday morning, and identified herself first and foremost as a Red Cross volunteer. This was also the case with the representative of the Binga police with whom we met. It was great to see that the Zimbabwe Red Cross Society is so well received in the district, that officials hold their status as a volunteer in such a high regard. At the the training center, I met the 12 volunteers who would be taking part in the workshop and assisting with the data collection. The volunteers were from Binga District, with a majority of them being from Saba Ward, so that their local knowledge of the area and people could assist in the planning and implementation of the mapping. We spent the first part of the day having conversations and discussing important features in the communities. One way we do this is by having the volunteers mark up an OpenStreetMap basemap that we bring with us. Each group of volunteers enjoyed speaking about their communities and what was important to them. On these maps, they drew water sources, markets, paths, and homes of their friends and families. ZimCross staff and volunteers highlighting important points in their community. CC-BY American Red Cross. In the afternoon, we discussed and collaborated on the design of our form for OpenMapKit. Working with local stakeholders is one of the most important steps in creating a survey; they are the people who know what is important to their communities, and they are the people who will benefit from the data being collected. The discussions were mostly spoken in the Tonga language, which is spoken by the Tonga people in both Zimbabwe and neighboring Zambia. The ZimCross staff members would translate for me if there were any questions regarding implementation, but the conversations were driven by the ZimCross staff and the volunteers. We tried to limit the number of “fill-in-the-blank”-style questions to help ensure a better quality of data. Using the OpenStreetMap Wiki Tagging Guide as a reference, we were able to build our form. After we had our OMK form set, we practiced. 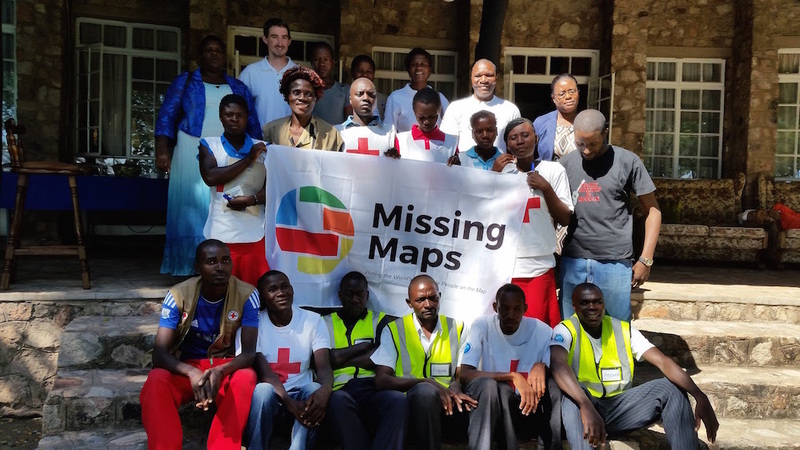 With the Missing Maps project, we interact with a broad spectrum of volunteers: younger, older, tech-savvy, and some who may not have used a smartphone before, all driven by the goal of assisting their local Red Cross Society in its mission to alleviate suffering. The volunteers in Binga were no different. Some had worked on previous ZimCross mobile data collection projects, others had not. We spent time in the afternoon getting used to the phones (Samsung Galaxy series), and walking through the process we would be completing in the field. The volunteers were paired up and practiced the surveys at points around the training center. The second day, we spend the morning recapping what we learned the previous day, and in the afternoon, went to the community of Siamwinde, which is outside of Saba Ward, but there are many of the similar interventions from the BRACES Project, such as latrines and cookstoves. After the data collection, we regrouped and discussed any obstacles faced in the field. Mapping a latrine in Siamwinde, built as part of the BRACES project. CC-BY American Red Cross. Days 3 and 4 started at sunrise, as we began the hour-long drive to Saba Ward. We gave three groups a Garmin GPSMAP 64 device, which would be used to map the pipeline. The other groups were divided throughout the remainder of the area, with ZimCross staff acting as Field Team Leaders. I floated and was able to check on each group’s progress and troubleshoot any phone/GPS issues. It was hot. Temperatures reached into the 90s by mid-morning (and this was winter) but whenever we met with a volunteer group, we were greeted with the biggest smiles. On day 4, we had one group of volunteers, along with a field team leader, walk over 20km to reach the community of Kenjobo, where one of the volunteers was from. It was faster for these volunteers to walk the 20km than to drive the 140km to a closer approach. The dedication of the ZimCross volunteers remains an inspiration to me. ZimCross staff and volunteers discussing the workplans for the day. CC-BY American Red Cross. While we met with one group, to determine the best location to have them walk to next, we spoke with a community member who knew which paths led to where. He told us the community we were trying to reach would be a difficult walk, several kilometers with some overgrown parts of the path. The volunteers said this distance was no problem, and started on their way. The community member responded “Okay then, just be careful of the landmines.” This was a sobering reminder of the conflicts and hardship that these communities have experienced, well within a generation’s time. The landmines in the area were remnants from the Zimbabwe War of Liberation during the 1960s and 70s and the conflicts that continued into the 1980s. Determining that this was an unsafe path to have the volunteers travel, the community we were trying to reach was not mapped as part of this project; however, that community has received interventions in the form of cookstoves and a latrine. After the second day of data collection, I submitted the data to our OpenMapKit server, and started looking at it and cleaning it up. Over 350 points were collected, including 161 cook stoves, 131 latrines, 32 taps, 5 storage tanks, 9 boreholes, in addition to the 24 km of pipeline was mapped. All of these locations have been added to OpenStreetMap, and are available for anyone to use. 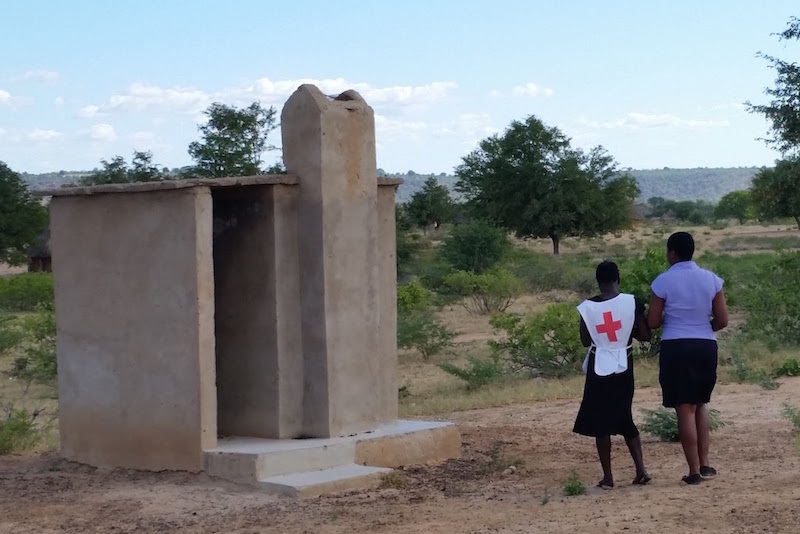 The Zimbabwe Red Cross Society can now visualize the impact they are having in the communities in which they serve. With the volunteers, we walked through the process of cleaning the data, and uploading it to OpenStreetMap. The most memorable moment of this trip for me, was showing the volunteers on our final day, the data they collected, on a map. Smiles stretched from ear-to-ear. One volunteer said, “I have never been able to see my community like this before, I can now go and show my community the great things that the Red Cross has brought to us.” This is the benefit of an open platform. OpenStreetMap and the Missing Maps project have enabled these volunteers, the same volunteers who helped dig the trench last year for the new pipeline, see the direct impacts in their community. Data collected by ZimCross Volunteers. All data has been added to OpenStreetMap Map Data: OpenStreetMap Contributors. 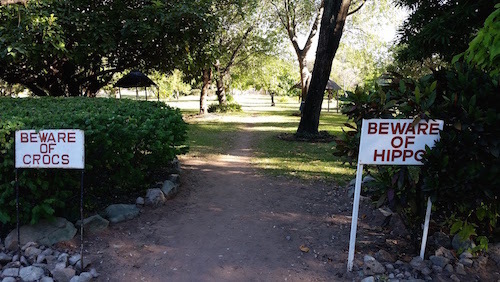 Warning signs in Binga. CC-BY American Red Cross. It was incredible to look out over the lake in the evening as the sun was setting, and see lights begin to fill the lake, all from the fishing boats that fish at night. In such a rural area, it appeared as if a city were stretching the length of the lake. All throughout the week I spent in Binga, I saw piles of “ele-poo” along the road, but we just kept missing them. After a quick trip to Victoria Falls before my flight, lo and behold, we saw six elephants heading to get a drink of water – quite the traffic jam on the commute to the airport. Close encounter with some elephants on the way back to the airport. CC-BY American Red Cross. Baboons also enjoyed darting in front of traffic. Check out this picture we caught with our Mapillary Camera of a baboon running right in front of us. A baboon runs in front of our car heading back to Victoria Falls. CC-BY American Red Cross. Everywhere I’ve gone with the American Red Cross has been rewarding in its own way. I enjoy working alongside volunteers throughout the world all dedicated to the Red Cross Movement. I was told that in Zimbabwe if someone has a long journey ahead of them, they’ll say they are “traveling to Binga”. My trip to Binga, while literal, also took me further from home than I’ve ever been, but was welcomed by so many great volunteers. The Zimbabwe Red Cross Society’s volunteers put themselves on the map, and now have the ability to continue doing so. Team of ZimCross staff and volunteers. CC-BY American Red Cross.